By default, the Smoothwall contains a number of policies which you can deploy to detect and prevent intrusions. It is also possible to create custom policies to suit your individual network. 1. Go to the Services > Intrusion system > Policies page. Tip: If the list of signatures takes some time to load, try upgrading to the latest version of your browser to speed up the process. • Name — Configure a meaningful name for the custom policy. • Signatures — From the list, select the signatures you want to include in the policy. For information about how to add custom signatures, see Uploading Custom Intrusion Signatures. 3. Click Add. 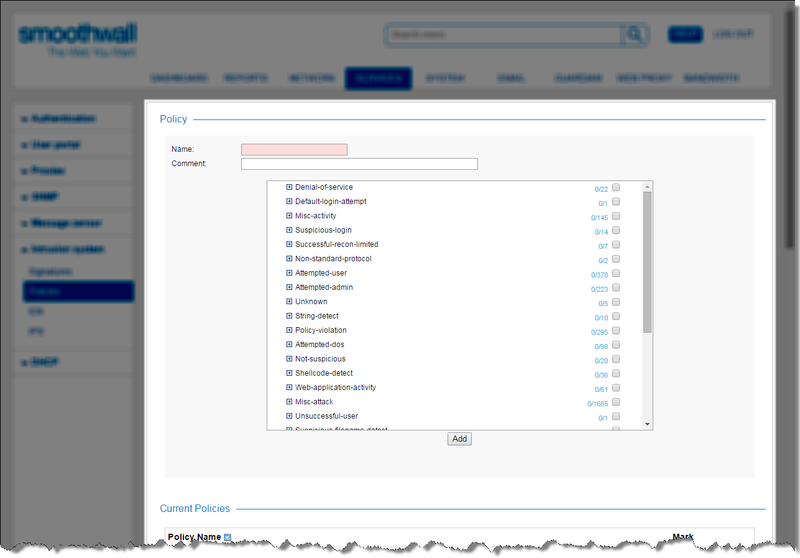 The Smoothwall creates the policy and lists it in the Current policies area. The policy is now available when deploying Intrusion Detection and Intrusion Prevention policies. For more information, see Deploying Intrusion Detection Policies and Deploying Intrusion Prevention Policies.